Let’s face it, we rely on the ponytail. No matter how long or short your hair is (with some exceptions, of course!) pulling your hair back can be a welcome relief to styling your hair or – even worse – washing it. The horror. But just because we can depend on our good friend the ponytail doesn’t mean we need to abuse it with the same boring routine. To spice up your pony, try these 17 fresh ways to wear your go-to hairstyle. Distraught hair is very trendy right now. The aim is to basically look like you got out of bed looking fabulous, which this inside out pony accomplishes very well. You woke up like this. The fun things about braids is that they can come in all shapes and sizes! This pony features two small braids, one on each side of your head. This look can be done different ways (I’ve done it with clear, plastic bands in my hair), but the goal is to section off your hair into little cinches so it looks like a faux-braid. For something a little twisted, try this topsy tail pony! Feeling extra twisted? This triple topsy pony should do the trick. If you have dreads, you can rock a pony, too! 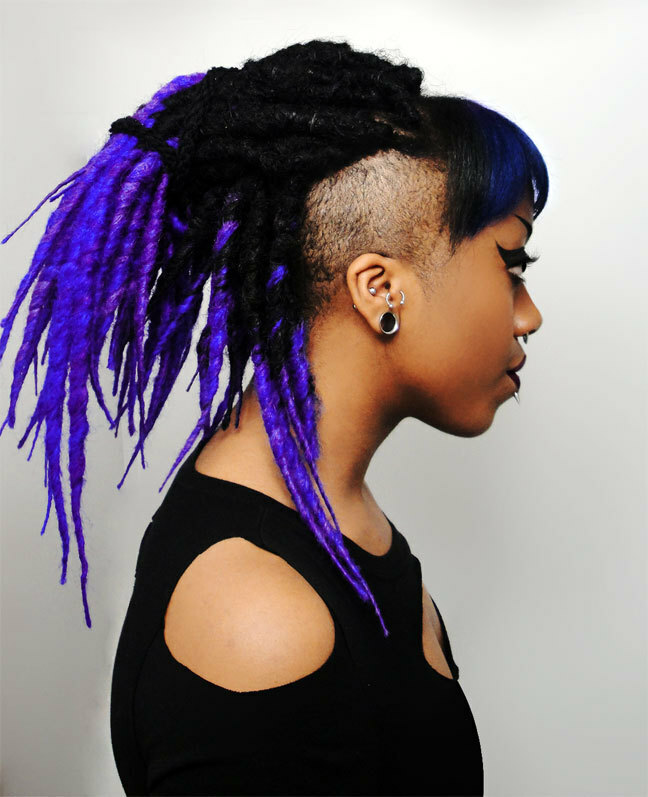 For extra awesomeness (as if you need it, you have spectacular dreads), dye your dreads so they show in the pony. Pony not long enough for you? This creative little double-pony hack will have your hair looking double it’s length in no time! This is an easy way to spice up your basic side pony and could even work as a last-minute formal hairstyle. Like I said, mess is in. Hang your ponytail low and then pull at the strands above the elastic to get as much messy texture as possible. A braid so simple, even I can do it. This big braid is an easy way to get some fast, interesting texture into your boring old pony. Get knotty with this clean, easy ponytail knot. Sleek without trying too hard? Check. Throwback pony. This vintage pony has the signature bump of the 60’s mod style and today’s trendy mess all in one. This look takes some time, but is worth the effort. Gradually add twisted pieces of hair to your pony for a loose, streetwear-ready vibe. If you’re a braiding master, this braided crown is for you. This look is polished and professional, but cute for your day-to-day look, too. Tie it all up with a bow! Cute and just the right about of preppy, this simple little bow is the perfect addition to your pony. Moral of the story: If Queen Bey is wearing it, you should try it, too. Experts only! Pony novices, start practicing now. Fishtails are more complicated braids, but have an interesting aesthetic if you can master the hairdo. Perfect for a job interview! This look is trendy and professional, and somehow accomplishes the female conundrum of that obnoxious hair tie you cannot seem to hide. Do you style your ponytail like a work of art? Tell us how! Share your brilliance in the comments section below.